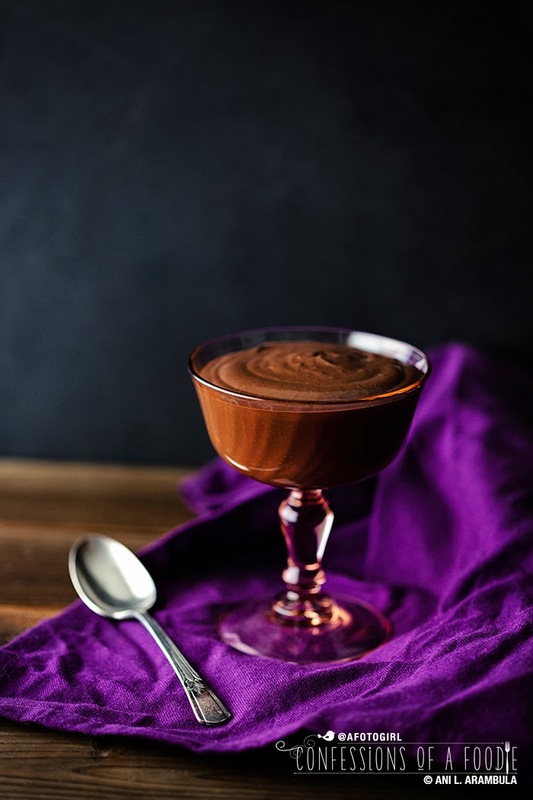 One of my favorite treats when I was a kid was warm chocolate pudding. I remember watching mom at the stove making it. I asked her the other day in a text message as I was preparing this post if it was from scratch or a box. She responded with a "Ha! Ha! Ha! It was a box. I didn't know how to make anything from scratch!" To that I say, "Mom, don't sell yourself short!" Let me remind you that your Red, Red Christmas Cake (Southern red velvet) with the Snowdrift Frosting (old-fashioned buttercream) that we always looked forward to every year was indeed from scratch. Ditto the yummy carrot cake you would sometimes make. You also taught me how to make frosting from scratch, cookies from scratch and countless savory dishes including homemade flour and corn tortillas (plus a yummy combination of the two flours for a "corn-flour" tortilla that I think you made up!). Back to this yummy chocolate pudding. I was feeling nostalgic but I didn't want boxed pudding as basic pudding is so simple and if you make it yourself, you can PRONOUNCE every ingredient without stumbling over five consonants in a row. I exaggerate, but you get the picture. 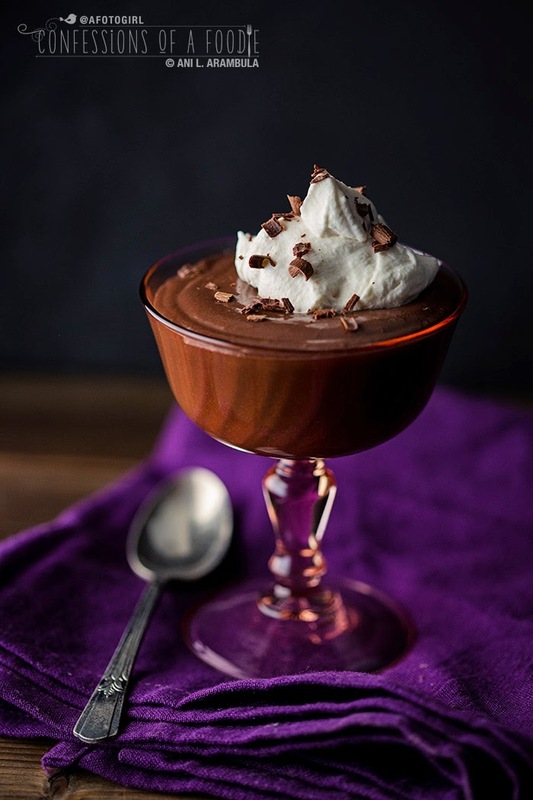 So, the most basic of American-style puddings is made on the stove and consists of milk, a flavoring (in this case, chocolate) and cornstarch to thicken. That's it. Period. I made this. Twice varying ingredient amounts. It was fine. It was just a wee bit one note even though I used top shelf Valrhona cocoa powder. My auntie tasted it. She said it was good but why go through all the trouble to make it from scratch when the result was that it tasted the same to her as Jell-O instant pudding. No bueno. Next. It needed a little something. Generally speaking, when you start adding tons of eggs you start to cross over into custard territory. Especially if you bake it. I didn't want custard. I didn't want mousse (not to say that either of those are not good; custard is just heavier than I wanted and mousse a heckuva lot lighter than I was craving). Also, I didn't want to feed an army. I just wanted to have a recipe in the bag for a single serve creamy chocolate yum (generous single serve and a more "sensible" portion when sharing with a friend or honey). The inspiration was everywhere. 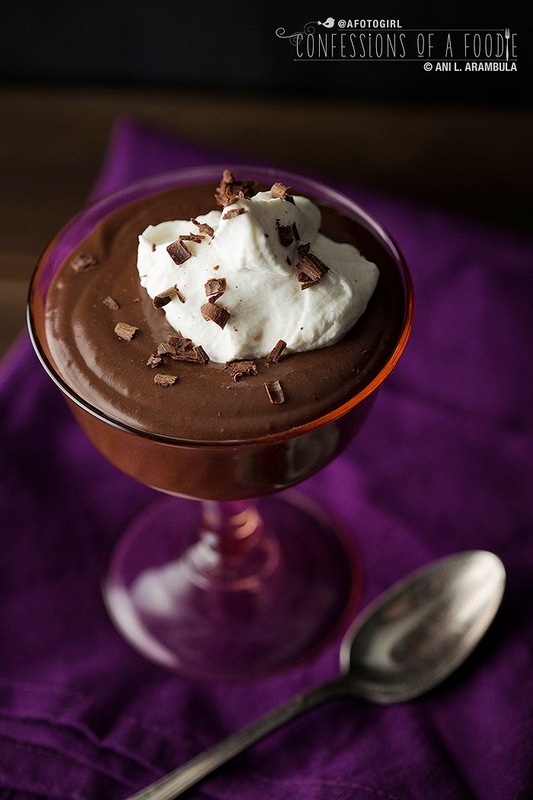 I started thinking about and craving chocolate pudding back in December and put it on my "2014 Ideas for the Blog" list.I logged onto Pinterest in January and was bombarded with several pudding recipes. I started researching, then experimenting. I made this version and photographed it in time for a Valentines post. But then a fellow food writing friend included one in her Valentines Day recipe roundup for a story she wrote for the newspaper. I decided to hold off on publishing mine. Then life got in the way and here we are today, a month after I landed on this recipe. I hope you find the wait worth it. When adding eggs to a hot mixture, they must be tempered first to prevent the egg from cooking and forming curds. Tempering simply means adding a small amount of the hot liquid slowly to the egg which will then gently bring the egg up to the temperature of the hot liquid. Once tempered, the egg can then be added to the hot liquid without fear of scrambling it. Also, a few notes on whipping cream: the bowl, whisk and cream must be as cold as you can get them. Stainless steel bowls work best but glass can be used in a pinch. Use the biggest bowl you can even for a small amount of cream. Reason being that this will give the cream the most amount of cold surface to come in contact with, speeding up the whipping process. Speaking of speeding up the whipping process, a light fluffy whipped cream means that lots of air has been incorporated into the cream. Using a more bulbous or round whisk will get more air into the cream faster, cutting down the whisking time. Place a large stainless steel or glass bowl into the refrigerator along with a whisk. Lightly beat the yolk in a small dish or cup; set aside. Place cocoa and cornstarch in a fine mesh sieve over a small bowl and sift them to remove any lumps. Place a small saucepan on the stove and add the cocoa mixture then whisk in the salt. Slowly pour in the milk, whisking continuously to combine, breaking up lumps. Switch to a rubber spatula to stir up any powder stuck to the sides and bottom of the pan. Turn the heat on to medium low and continue whisking for 2 minutes. Drizzle in the heavy cream, whisking vigorously to incorporate. Working quickly, add ½ teaspoon of the hot chocolate mixture to the egg yolk, whisking to temper the egg. Add an additional teaspoon, whisking to fully incorporate then whisk the yolk into the chocolate mixture. Allow pudding to just start to boil (bubbles will start to form around the edges of the pan); do not allow it to fully boil as it will scorch the milk. Remove from the heat and add the chocolate chips and rum, stirring until the chocolate has melted. Spoon the pudding into a serving dish. Cover the pudding with waxed paper (or plastic wrap) so that the paper is in full contact with the pudding to prevent a skin from forming. At this point, you can either continue and make the cream to serve with the pudding while the pudding is still warm or place in the refrigerator for at least 3 hours to chill and make the cream just before ready to eat. 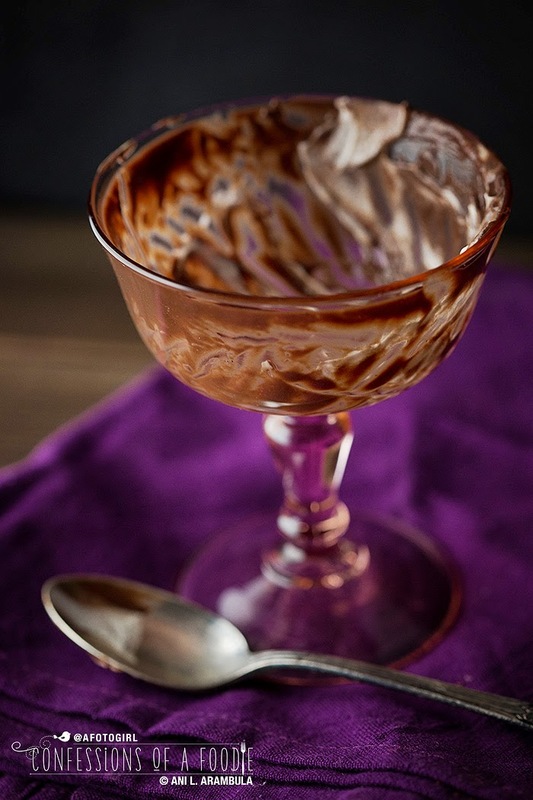 To make the cream, remove the bowl and whisk from the refrigerator and add the heavy cream, sugar and rum to the bowl. Whisk vigorously for three to five minutes until soft peaks form. Add a few dollops of cream to the pudding. Garnish with a small sift of cocoa powder or chocolate shavings if desired.